Children from Northland’s Maungatapere Primary School have been getting their hands dirty and learning about nature at Richard and Sharron Booth’s Titoki dairy farm. 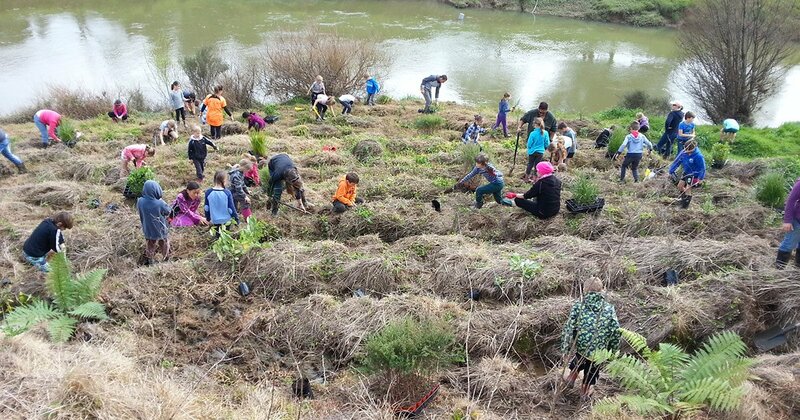 Over two days, 115 children, 20 parents, and four teachers joined forces with the farm team to plant 3000 native plants on a 50-metre stretch of the Mangakahia River bank. School teacher Carolyn Goodison said it had been a great experience for the seven- to eleven-year-olds from four different classes. The plants, among them cabbage trees, karamu, manuka, kanuka, kowhai and pittosporum came from several sources. 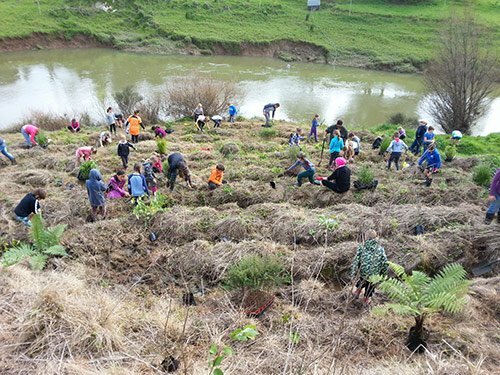 The Te Arai nursery supplied 1600 cabbage trees through the Integrated Kaipara Harbour Management Programme, and the Department of Conservation Fonterra Living Water partnership provided 1000 plants. Sharemilkers Andrew and Vicky Booth won a Farm Source promotion and spent the $2000 prize money on plants, and locals donated flax cuttings from their gardens. The Booths have been implementing a planting programme around the farm over the last five years. Their goal is to plant the entire two kilometres of river bank that runs through their property. “I would like to see these areas develop into what they probably once looked like. We have pockets of native bush on the farm, so it will complement those nicely. It all helps to minimise the farm’s environmental impact. Sediment loss is a big issue in Northland, particularly in the Kaipara catchment, so anything I can do to stabilise stream and river banks is beneficial. Preventing sediment loss and soil erosion also helps to control phosphorus loss which is also an issue in Northland. These are just two benefits of riparian planting,” says Andrew Booth. Involving the school was a good way to show the children about what happens on a farm, says Andrew. Photo: Children from Northland’s Maungatapere Primary School get their hands dirty at Richard and Sharron Booth’s Titoki dairy farm.